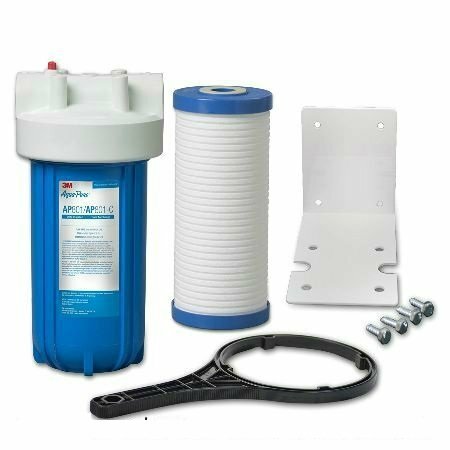 The 3M Aqua-Pure AP801-C is a whole house system that includes an AP810 sediment cartridge to reduce dirt, sand, rust and sediment from your water. Also known as part number 5585716 or 55857-16. Dimensions: 13 15/16" x 7 1/4"
Includes: 10" "Big Boy" housing, housing wrench, mounting bracket, AP810 cartridge. Required for installation (not included): a pipe cutter, two 1" male compression adapters, one 1" ball valve (compression type), PTFE tape and an adjustable wrench. 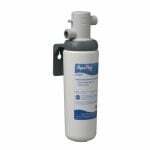 Install on cold water lines only. 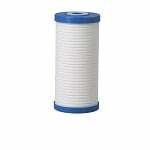 Click these links to view carbon and sediment filters for 10" large filter housings.